Spirits were high, ‘though the day was chilly. 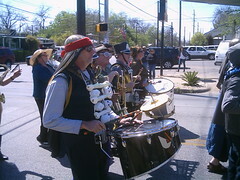 Celebrate Texas organized a fine parade. There were veterans’ contingents, a Shiner Beer van distributing Shiner lapel buttons, Lone Star flags for the little children, two contingents of lions and dragons, and much, much more, including two wonderful bands from Austin high schools: the Eastside Memorial Panthers and the Bowie High School marching band. James and Annetta White of the Broken Spoke were the parade honorees. Spirits were lifted by the singing of an a capella choir, from the Cowboy Church. The Daughters of the Republic of Texas passed by on horseback. The Texas Cowboys startled a dog or two. The Plungettes, with their plumbing gear, and the Beachers, with their lawn chairs, turned out as they do for almost every parade. The Eastside Panthers marched with pride in t-shirts and shorts, despite the chill. The Bowie band turned out in full uniform, complete with plumes; the band seemed to be 150 strong. We loved them both. Congress Avenue was intended as to be a processional way. See some unedited videos and recall the fun or see and hear some of what you missed. We love a parade!